Well, it’s a week of brilliant colour, and I think a good part of that can be attributed to the sweet peppers finally taking on their red and yellow hues. We also have the attractively striped delicatta squash, which has a more “potato-like” texture than other types of squash. This week’s veggies with fresh dill dip! So what to do with this week’s box? Again, veggies and dip would be an excellent choice- here is an example of all the great colours you could use. 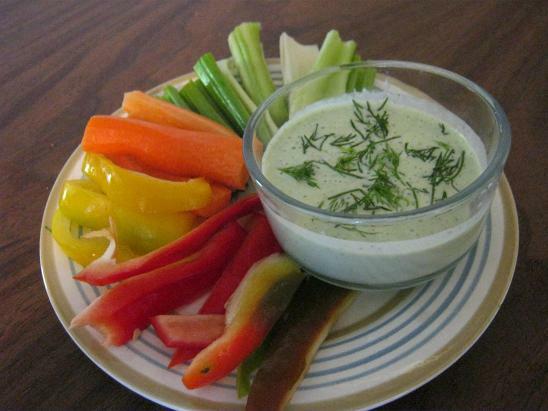 How about making the fresh dill into some tasty dill dip? Just add to some sour cream, finely chopped and stir along with some onions and garlic. I tried making some with some plain yogurt and a little lemon juice and cream cheese and putting it in the blender but it turned out extremely runny. I still took a pic so the blog would look pretty! Another idea to incorporate your carrots and celery is chicken pot pie. It’s really not as intimidating as it sounds. I normally just chop up some carrots, celery potatoes and cauliflower (if you happened to save some from before) and mix them with a can of low sodium cream of mushroom soup mix and just enough milk to make it sauce-like. Savory herbs like thyme, rosemary and sage along with good old pepper are delish to add some flavour. I put it all in a greased corningware pot (or multiple little ones) and bake on 375 for about 25 minutes with the lid on. Then I take it out and carefully roll out some pie crust dough (not too sweet) to the size of the container(s) and then pinch the sides closed and poke with holes to let steam escape. It’s about another 25 mins. till the crust is ready (lightly golden and firm but not hard). Here is a simple recipe for the crust- feel free to use your own or even a bought one http://allrecipes.com/recipe/best-ever-pie-crust/ . My chicken pot pie recipe may not stay together like the commerical ones, but it sure is tasty. Feel free to comment on suggestions for improvement. Sorry you haven’t head from me all summer-it’s been so busy! We are new to the program and totally enjoying every minute of our 1/2 share:) It’s like Christmas every second week…and we have tried many of your receipes and just love the whole communication and the way you update and deliver our wonderful organic items from the farm:) The no pasta lasagna was such a hit – don’t know why I ever used Pasta instead of Eggplant. Not to mention the Beat Soup – we didn’t put meat in and made it a vegetable beat soup…oh so good. These just to name the most recent recipies we have tried…can’t wait to try this weeks. Thanks for all…I am already feeling sad that it will end in October…but will be back next year and I am spreading the word! Have a great week…and Thanks again.